The only question remaining is whether or not Pershing actually drafted the letter, rather than simply coordinating/lobbying for action. The first Herbalife distributor I met accurately stated that HLF saved her life. This is a repeated story. I know which side of the moral argument I want to be on here - and it is not Bill Ackman's side. 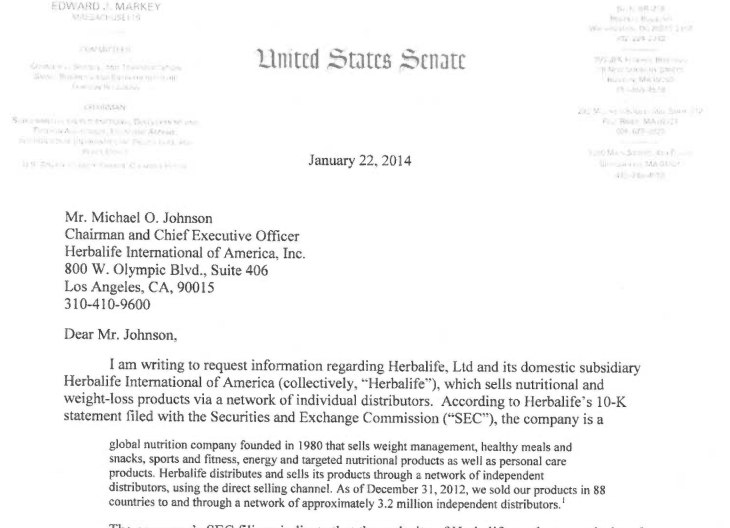 Will Senator Markey personally meet with Herbalife to do his own due diligence or will he remain as an accomplice to Ackman manipulation of the stock market? The shorts want to manipulate the stock only. Period. They are using impossible foolish questions to make it look like HLF is doing something wrong. Wow- As an American it never would have crossed my mind to doubt that thesis. If you thought that was silly, I want to emigrate to Australia. "The first Herbalife distributor I met accurately stated that HLF saved her life." Anecdotal and irrelevant in light of the overwhelming statistics to the contrary. In the main, Herbalife thrives at the expense of its "distributors" and can only do so by creating the illusion that there is a legitimate business opportunity selling over-priced, ordinary products. The only thing worse than failing as an Herbalife distributor is succeeding as an Herbalife distributor. Michelle tweeted that she got her version direct from Markey's website, and that perhaps they updated it. If true, then what might have happened is Markey had sent earlier version to Ackman (and possibly others) on the 22nd. When they saw the reaction it generated when released publicly on the 23rd, Markey's people updated the dates to try and hide the fact they had shared it before making it public. Is it possible to see total put volume traded on the 22nd vs average, the day some people had the letter? That is, without individually adding up every strike? Sheesh, nice investigative work John. This is really incredible. And to think that the government is impartial. Now Scott Dinneen is gone, likely ran out after crafting a bad short thesis. There will be books written on the Herbalife matter. if you are still under any illusion how the USA is run please read "The Rich & The Super Rich" by Ferdinand Lundberg. It was written in the late sixties but is still as relevant as ever. Sometimes the government does act against bad guys. How's that AFSI "short squeeze" long going for you? I think you owe some apologies John. The Google cached version of Markey's website shows the date on the letter as 1/22/2014. 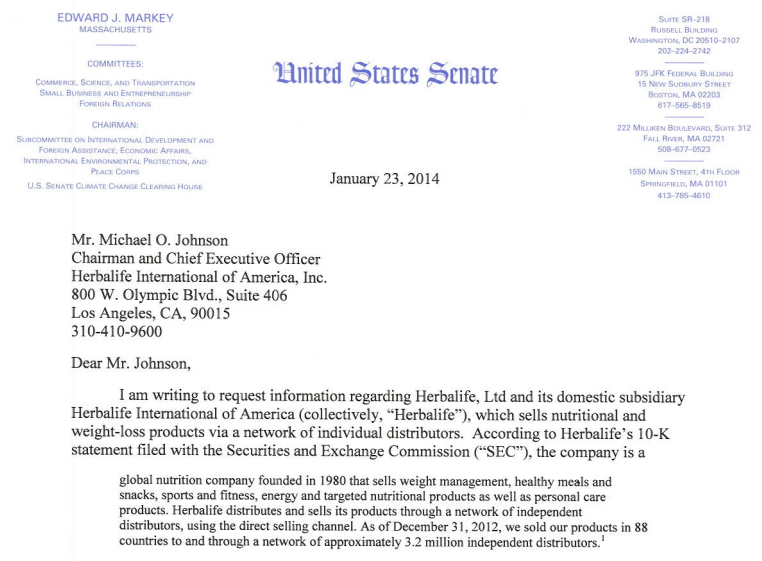 If that didn't work, just search for the file name in Google, "www.markey.senate.gov/imo/media/doc/2014-1-22_Johnson_Herbalife.pdf" and then click on the little down arrow to the right of the title in the first result and select 'Cached'. Why isn't this front page news in the US? I just don't get the media's lack of hunger when there clearly is a cracking story. John,you are over your head here in the case of Herbalife.It's not about selling"securities,products,SEC reporting and friendly testimonials".It's about the illegal selling of "Business Opportunities".It's not a Direct sales model,it's a Pyramid powered model in the MLM space.Hughes started as 100% Pyramid and they made only some minor changes over the years. Not enough space here to explain but simply state "me and my wife look alike but I marry her for the difference".